This gentleman stands in the front rank among the leading farmers of Northwestern Illinois. He comes of German ancestry, but the family have for several generations been Americans. His great-grandfather, Pharaoh, who was a native of Germany, came to this country at an early day, in company with one or more brothers. He settled in North Carolina, but the others went to Tennessee, where their descendants are yet numerous, that branch of the family spelling the name Fentress. Pharaoh and his wife, Elizabeth Needham, had one child, Frederick, who was the grandfather of our subject. The latter married Mary Winslow, a native of England, and they were the parents of seven children, viz: Nancy, Rebecca, Eleazer, Emily, Caroline, Elizabeth, and Frederick. Nancy married John Burrows, and died in Hennepin, Ill,; Caroline was the wife of James Clark and died in North Carolina; Elizabeth was wedded to John Coffin, and died in Indiana. The only son, Frederick, was the grandfather of our subject. Frederick's son, Eleazer, was the father of Henry N. He was born in Randolph County, N.C., in the year 1800. Eleazer Frentress was married to Diadamia Bowles, daughter of John and Lucy Bowles, natives of Vermont, and early settlers of Illinois, coming there about 1826, and locating near Galena. The mother, Lucy, died near Alton, Ill., leaving two children - the mother of our subject, and another daughter named Lois. The father, John, went to California in 1848, being one of the early emigrants to the land of gold, where he died in 1849. Eleazer was married to Diadamia Bowles, at Sainte Genevieve, Mo., Dec. 25, 1823, and then returned to Madison Country, Ill.; having crossed the Mississippi to get married. In June, 1827, Mr. Frentress removed to Galena, taking passage on the well-known boat "Indiana." He lived there until late in the summer, when, taking his wife and two small children, in company with several others, he went up the river and laid out the town of Cassville; Mr. Frentress driving the first stake. The small colony then turned their attention to mining. But one day there came in hot haste a messenger to tell them the dreaded Winnebagoes were on the war-path, and burning and massacring all found in their way. An instant retreat was made to Galena; the party comprising two women and two children, twenty men and twenty horses. They traveled all night, Mrs. Frentress carrying the baby before her on the horse; the little boy being carried by a sick man of the party on another horse. In this way their flight was made, and they arrived in safety at Galena. Mr. Frentress at once enlisted in the then raging Black Hawk War, and served until the final surrender of the savages. After the return of peace Mr. F. made a visit to his sister, at Peoria, Ill., and then went back to his mines. He worked there until the winter of 1831-32, when he sold his interest for $700, and coming back to Galena, bought a team of horses and a couple of cows, and rented a farm four miles north of Galena. The following year he made a claim of 300 acres, on which he built a double log-cabin. This was the nucleus of the family homestead, and here the sturdy pioneer died, in 1853, at the comparatively early age of fifty-three years, leaving an estate of over 1,100 acres of land, all well improved, made so by his own exertions and untiring industry, ably seconded by the labors of a careful and prudent wife, and supplemented by the work of his sons. His family consisted of ten children, of whom seven survive him, viz: Thomas W., John B., Emsley H., Frederick M., William M., Henry N., and Mary A. Three - Lucy, Charles and Amelia - are deceased. The pioneer mother died on the home farm Dec. 13, 1887. The old log house, built in 1831, still stands - a memento of those early days. A large and commodious brick dwelling had taken its place several years prior to the mother's death. Henry N. Frentress, the subject of this sketch, was born on this farm Sept. 22, 1842, and there he has ever since lived; and of the original 1,100 acres he is the owner of 700. To say that he has a fine farm would not express it. It is one of the model farms of Northwestern Illinois, and is situated on section 34, Dunleith Township. Under his own direction the improvements have been made. The barn is a model one in every respect. It is 130x70 feet, with stable room in the basement for about 200 cattle. An invention of his own takes a whole wagon load of hay off at once when drawing in, and everything about the place denotes a master hand, guided by a thorough knowledge of his business. His fences are all in excellent shape, the farm laid out in convenient fields, and everything done to make this one of the finest stockfarms in this section of the State. Mr. F. is quite of an inventive turn of mind, and many of the labor-saving devices on his place originated with himself. He is also the inventor of a barbed wife for fencing, and a machine for making it, and established its manufacture at East Dubuque. He subsequently sold his patents and factory to the Frentress Barbed Wire Manufacturing Company of East Dubuque, by whom it is now made. Our subject was married, Mary 6, 1869, to Miss Mary J. Bidlack, daughter of Charles F. and Amelia (Hull) Bidlack; the father a native of Pennsylvania, and the mother of Monroe County, Ill. This union has been blessed by the birth of two children - Lois M. and Thomas L. The family belong to the Universalist Church, as did the parents of Mr. Frentress and his wife's father. Her mother was a member of the United Brethren Church. Politically, one Frentress family, with the exception of one brother of our subject, are Republicans. The latter has never sought public office, but has represented his township in the County Board since 1878, and is now Chairman of the Board. Socially, he is a member of Martin Lodge No. 491, A.F.&A.M., of East Dubuque. As a man, a representative farmer, and a good citizen no man to-day stands higher in Jo Daviess County than does Henry N. Frentress. 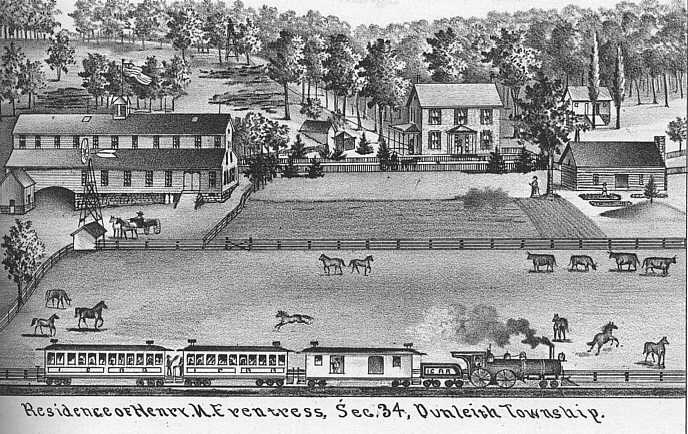 A view of his splendid homestead is given in connection with this brief sketch.